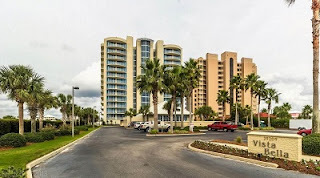 Orange Beach AL condominium home for sale at Vista Bella. Enjoy breathtaking panoramic views of Old River and the Gulf from this sought after East-end 3BR/3BA corner unit in an upscale luxury condo! Exquisite Master Bedroom/Bathroom with garden tub and balcony overlooking Gulf. High ceilings and soaring windows heighten the feeling of space. Deeded Boat slip to be sold with unit. POA owns private deeded beach access. Sold unfurnished.